你现在的位置：网站首页 - 谷歌优化 - 东莞外贸网站优化公司客户案例：Dongguan Naser Machinery Co.,Ltd. In 1989, Naser (Hongkong) Group Co., Ltd. was established in Hongkong, is a collection research and development, production, sales, service as one of the modern high-tech group company, Mr Naser through continuous improvement and improve the quality of products, the accumulation of experience design and production for many years, has laid a solid foundation for high quality products. Nagin people forge ahead, constantly innovation, honor their commitments, won the unanimous praise of the new and old customers at home and abroad, the Nagin products a wide range of services to the plastic, electronic, electroplating, laser, food, textile, chemical industry, packaging, pharmaceutical and other industries. In 1992, Mr Nagin group senior was unanimously approved by the division of labor, build factory in Hengli Town, Dongguan city investment, plant name as ---- DongGuan Naser Machinery Co., ltd Dongguan naser machinery inherits the naser group spirit of enterprise, always adhere to "survive by quality, technology innovation, market-oriented, to serve and development" purposes, the gold group future development to a new height. NAser know, want to be in the wake of the financial crisis to achieve rapid development, we must actively implement quality + brand + standardization strategy, rely on independent R &amp; D and innovation, so as to realize the diversification of products, superior quality, customer, service integration. As a leading member of plastic auxiliary industry, Mr Naser based on reasonable profit on the full range of services to customers, and strive to achieve greater development in the auxiliary equipment industry. The leading product s: cold water machine, industrial cold water machine, water cooling machine, water-cooled industrial chillers, air-cooled chiller, air-cooled industrial chillers, dryers, dehumidifiers, dehumidifier, hopper dryer series, mould temperature control machine, mold temperature machine, mold temperature machine oil type, water type mold temperature machine series, fully automatic suction machine, single suction machine, split suction machine series, plastic crusher, crushing machine, plastic crushing machine, plastic machine, plastic machine, plastic crusher, strong crusher, plastic crusher, machine series plastic scrap, color mixer, mixing machine, mixing machine, plastic mixing machine, plastic mixing machine, mixer, large tonnage of mixing machine, large tonnage blending machine, large tonnage mixing machine, vertical color mixer, vertical mixing machine, vertical mixing machine, horizontal mixing machine, horizontal color mixer, series, horizontal mixer tower, cooling tower, cooling tower, cooling tower, cooling tower water tower industry, high temperature, high temperature industrial water tower, high temperature industrial cooling towers, high temperature cooling tower, countercurrent tower and installation engineering etc..
description: Looking for high-tech chiller with reliable performance? 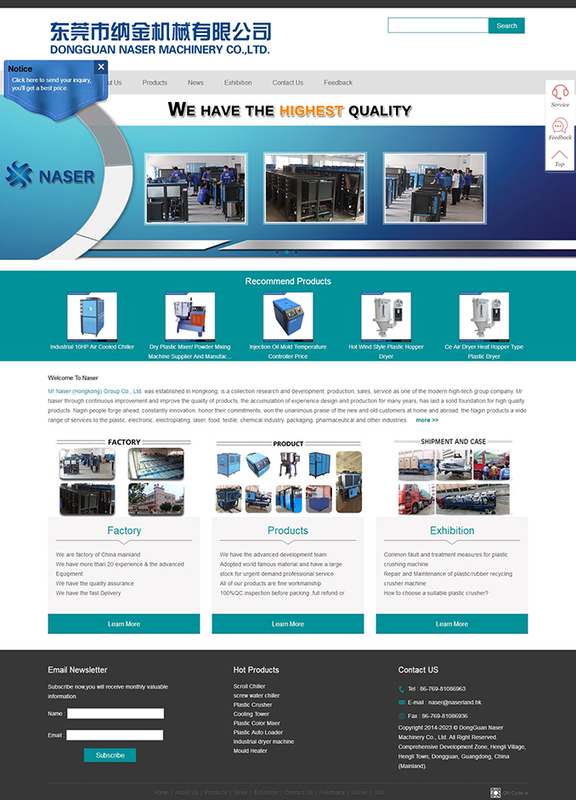 Naser Machinery must be your best choice, who can offer you high quality and high precision chiller, plastic crusher, plastic color mixer, mould heater, cooling tower. Come and get more details with us.